It’s about time Bruce Lee be given his proper place in the history of modern mixed martial arts. Bruce Lee, pound for pound, was arguably the greatest fighter of our time. He is certainly the most popular. Fourty-one years after his death, he remains the standard by which all other fighters are measured. His passion, skill, charisma, philosophy, and innovative martial arts concepts brought him worldwide acclaim– incredibly, all by the age of 32. 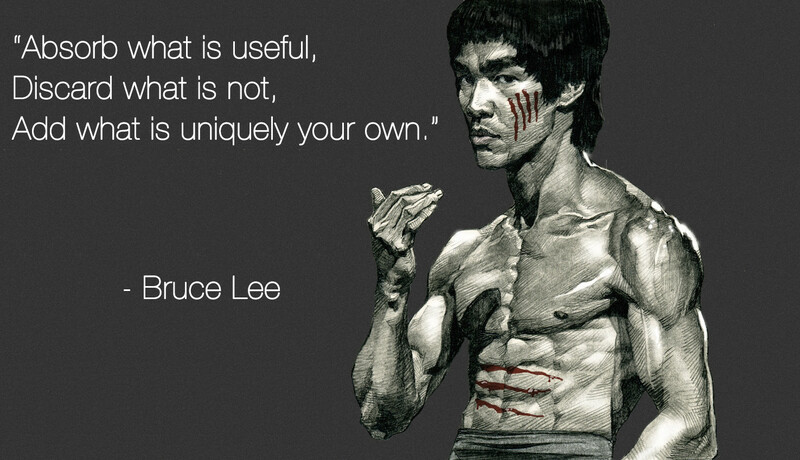 Lee was a brilliant philosopher who successfully applied his insights to the martial arts. Bruce Lee was looking for something new, something different and something distinctly his. It was because of THIS that Bruce Lee became a legend. Contrary to popular belief, the story of modern mixed martial arts doesn’t begin with UFC 1 in Denver in 1993 or with the Gracie family of Brazil. Though of course the Gracies deserve a prominent place in the history of MMA, their intention was never for fighters to begin training across styles. Quite the opposite! Their intention was to prove that Gracie Jiu-Jitsu was the most dominant style of martial arts, a traditional and now seemingly archaic notion about dominance of a single fighting art. Sport MMA is an unintentional by-product of their goal. UFC 1 created the most prominent forum ever for martial arts styles to mix, but the philosophical underpinnings of MMA began in the San Francisco Bay area in 1965 by an ingenious martial arts pioneer: Bruce Lee, known in his native China as Jun Fan. At a time when the Confucian reverence for tradition characterized the martial arts world, Lee came along to challenge it all with an antiauthoritarian approach that was unlike anything anybody had ever seen in the West. While the exponents of different martial arts styles argued among themselves about which art was the best, they all agreed on one basic concept: there is such a thing as one perfect art, which a perfect methodology and perfect techniques, which alone embodies the Truth in regards to combat. Naturally, much like the members of many organized religions, each claimed their art was the One. But according to Lee, they were all wrong because the very concept of separate “styles” of martial arts is wrong. He considered styles to be ideological prisons limiting the individual freedom to pursue one’s own path. In Lee’s view, they all had good ideas and good techniques, but they were all hopelessly deluded if they thought their partial truths were the Only Truth. Not all the knowledge can be found in the house of the same teacher. Lee believed individuals needed to be exposed to different methods in order to figure out what works for them. Lee advocated cross training, picking and choosing what suits one best from all styles of martial arts. Lee’s revolutionary yet simple approach was broken down. People should experiment with as many paths as possible and extract the best out of all of them. Lee invited martial artists to resist the temptation to crystallize their discoveries into a fixed style. Instead he invited them to engage in a process of research that would keep their ideas fresh, and would spur them to constantly evolve as fighters and as human beings. Lee’s plan was to be able to use the strengths of any style without being bound to its weaknesses. Following a method – any method too closely – robs us of the flexibility necessary to face life, since by its very nature life is vaster than any law or rule. Too many rules suffocate individuality. People are different by talent, taste, and experience. To expect everyone to follow the same formula is a fascist dream that is completely out of touch with the essence of life itself. Most of the martial arts community didn’t respond kindly to Lee’s ideas. They were outrages by what they perceived to be an arrogant slap in the fact of tradition. It takes a lifetime to perfect the practice of one art, and yet this guy has the audacity to think he can briefly dabble in many arts and based on experience extract the best out of them? By abandoning time-honored methods all he is going to accomplish is to become a stereotypical jack-of-all-trades and a master of none. Hard line insistence on absolute values and sanctity of traditions written in stone seems more of a tough guy act that stems from insecurity, poor self-confidence and fear. Not only is mixing more in tune with the globalized world it is more in tune with the biological essence of life itself. Mutts are always healthier than purebred dogs. A person who develops the many talents necessary to explore a variety of difference sources, discovering their strengths and mixing them together harmoniously is not showing weakness or lack of discipline. Au contraire! They are making a choice that is born out of very strong convictions – strong enough as to be willing to experiment and change one’s mind. This is definitely not the easy way out. It takes incredible guts to leave the herd behind, to become your own leader, forging yourself in the fire of unfiltered experience. Because of the very physical nature of martial arts, one can go on talking for only so long before he or she is invited to step up and put their theories on the line. Martial arts theory is tested not through flowery debates but in combat. At the end of the match, you are either the one left standing or the one on the floor. NO arguments there. Fighters can spout the best speeches in the world about the superiority of their art and training methods, but if they keep getting knocked out, they will be forced by reality to revise their ideas. Because of this wonderfully concrete aspect of marital arts, Lee’s inflammatory ideas were eventually tested and vindicated in the early 1990s through the development of mixed martial arts. Traditional artists from very corner of the globe stepped up to defend the honor of their systems. This after all was their chance to prove in a public forum the superiority of their style. No single art turned out to be “the best”. Just as Bruce Lee has predicted, traditional martial artists became easy prey from those fighters who followed Lee’s insight by picking the best techniques from several different sources and mixing them together. Mixing different elements together is an art. Tossing a bunch of random ingredients together without truly understanding any of them is not. This was the most indubitable proof that in the right hands an eclectic syncretism is far superior to rigidly following a single path. He was thirty years ahead of his time in the way he thought about reality fighting, but also his passion, charm, and grace is a model for the sport and for Life. This entry was posted in Culture, Health and Fitness, Martial Arts, Philosophy, Religion, Spirituality and tagged Bruce Lee, Confucianism, Jiu-Jitsu, legend, life, Martial Arts, Mixed Martial Arts, MMA, philosophy, Sport, The Way. Bookmark the permalink.